This light, bubbling piece was composed for and premiered by Third Wheel. A tender lullaby on a text by Colin Sterne. 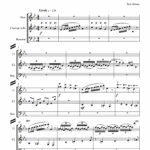 This website provides information about composer Paul Gibson and his music, including his scores and recordings. See here for Gibson’s YouTube entries. If you have any questions or comments, please write me at Paul@PaulGibsonMusic.com. To receive my composer newsletter, please subscribe here. Dr. Mary Breden will lead the Combined Choirs of Loyola Marymount University in my Salve Regina on May 3 as part of her final LMU Spring Chorale. Tickets available here. On December 6 and 8, Dr. Mary Breden conducted the premiere of Sleep, Holy Babe, for chorus and solo trumpet, at Loyola Marymount University, as part of LMU’s annual Christmas concert. Recording now available on YouTube. Eminent conductor and organist John Romeri, music director at Christ Cathedral in Orange County, interviewed me for his radio program “Music from the Tower.” It will be broadcast on KHJ 930 AM and KCEO 1000 AM on Saturday, November 3. It then becomes available online at ChristCathedralMusic.org beginning Monday, November 5. MusicSpoke, a major musician-run outlet for contemporary scores, has begun to make selected pieces of mine available through its website, beginning with El Cantico del Alba and In qual parte del ciel. Due to a misunderstanding, nine of my pieces that appeared on YouTube were deleted. UPDATE: Nick Gianopoulos started a new channel that has returned the missing score-videos. Visit my playlists here to see all currently available videos of my music. On April 25, the Kutztown University Chamber Singers, under the direction of Dr. Henry Alviani, will perform my Salve Regina. The 7:30 p.m. concert will be presented in the Old Main Georgian Room of Kutztown University of Pennsylvania. The Shepherd’s Lot officially released! E.C. Schirmer has officially released my The Shepherd’s Lot, my companion piece to Schubert’s Shepherd on the Rock. Scored for soprano, clarinet, and piano, my cycle includes three poem settings and a piano intermezzo. See and hear it on YouTube, courtesy of Nick Gianopoulos’ channel. Harp Column magazine has published a review of the Debussy Trio’s latest release, Angles of Angeles, which includes my three-movement work Ternion Sonata No. 1. Please read here. Download the entire Sonata for $1.99 at Fatrock Ink. As part of the Pacific Southwest Intercollegiate Choral Association’s 89th Annual Festival Concert, the Consort Singers of Loyola Marymount University performed my setting of Salve Regina at a packed house in Bovard Auditorium at USC. Dr. Mary Breden conducted and composer/conductor Z. Randall Stroope (far right) adjudicated. Los Angeles Philharmonic announced that the full 13-member brass section of the orchestra will premiere my Fanfare as one of their 50+ commissions for their Centennial season, 2018/19. Details to be announced. On December 17, the Los Angeles Children’s Chorus and the Pasadena Symphony under Grant Cooper gave two performances of my Ring Out, Wild Bells as part of its Holiday Candlelight concert at All Saints, Pasadena. Dr. Mary Breden led the Festival Honor Choir of the Pennsylvania Collegiate Choral Festival in Gibson’s Salve Regina on NOV 11 in the acclaimed acoustics of Stretansky Hall (right) at Susquehanna University. 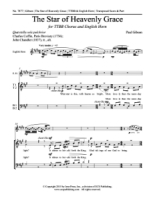 Please check out this score-video of a sacred work for SATB chorus and solo flute. Support Nick Gianopoulos in his work creating these. Now see and hear the score of my companion piece to Schubert’s Shepherd on the Rock, three settings of William Blake poetry plus a piano interlude. Support Nick Gianopoulos in his work creating these. Gibson’s Noel, Noel, Noel was included in St. Olaf College’s two performances, March 10-11, in Orchestra Hall, as part of the American Choral Directors Association National Conference in Minneapolis. Mark Stover conducted the Viking Chorus. The superb singers of the National Children’s Chorus, conducted by Luke McEndarfer, performed Dona nobis pacem/Grant Us Peace as part of their Carnegie Hall concert devoted to Peace. 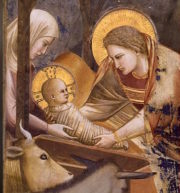 The program was repeated the following Saturday, December 17, at L.A.’s Cathedral of Our Lady of the Angels. The male voices of St. Olaf College’s Viking Chorus, conducted by Mark Stover, performed Noel, Noel, Noel, as part of the St. Olaf Christmas Festival, one of the oldest Christmas celebrations in the U.S., on December 1-4. Recordings of the festival are available here. Listen to the MPR broadcast. The final concert of 2016’s unSUNg series at St. Mark’s Episcopal Church in Glendale included my first and latest song sets. Four extraordinary musicians – tenor Charles Lane; Paul Sherman, oboe; Melinda Rice, viola; and Roger Lebow, cello – opened the concert with Two Songs on Chinese Love Poems (c. 1977). As part of Dr. Sally Etcheto’s celebratory retirement recital, a reunion of former members of Zephyr: Voices Unbound sang Gibson’s chant-based Salve Regina, which was composed for Zephyr’s Mission Music CD. This FREE concert was presented in the Music Building of California State University, Dominguez Hills on May 15. The award-winning ensemble European Concert Trio (Amanda Walker, clarinet; Harriet Fraser, soprano; Irina Bazik, piano) gave the three premiere performances of Gibson’s The Shepherd’s Lot, a companion piece to Schubert’s Shepherd on the Rock, on Feb. 19-21 in Encinitas, Torrance, and Beverly Hills. Artistic Director Grant Gershon and the Los Angeles Master Chorale beautifully performed my 8-voice expansion of the Renaissance motet Rejoice in the Lord Alway, using SATB choir and brass quartet, as part of their Christmas concert this season. 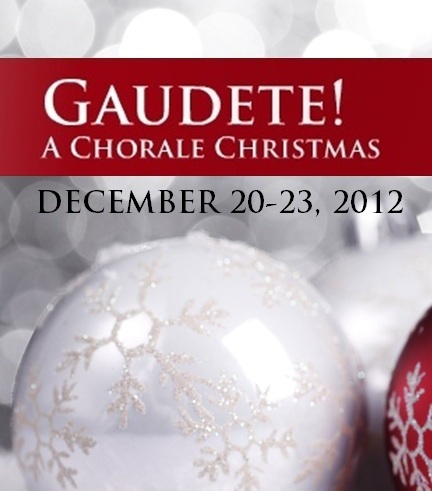 Hear the double choir version. The Texas Choral Directors Association has selected Paul Gibson’s Noel, Noel, Noel (four-part men’s chorus, English horn) in the category of High School; Holiday. The recent ECS release can be previewed here. Dr. Mary C. Breden led the combined choruses of Loyola Marymount University with professional orchestra in the world premiere of Paul Gibson’s Te Deum on May 1, 2015, in Sacred Heart Chapel at the Jesuit school. Watch the score and hear the premiere on YouTube. The Debussy Trio performed Gibson’s Ternion Sonata No. 1 at the Morrison Center, Idaho’s Premier Performing Arts Center, at Boise State University. As part of their Jubilate celebrations, the National Children’s Chorus performed Gibson’s Dona nobis pacem/Grant Us peace at the Church of St. Paul the Apostle in New York on December 14, and at the Broad Theatre in Santa Monica on December 21, led by Artistic Director Luke McEndarfer. Inspired by the poem “Asleep” by Wilfred Owen, Gibson’s He Sleeps Less Tremulous: A Lament for English horn and string quartet was given a read-through on Nov. 17 by Sarah Bloxham, Tom McEvilley, Robert Matsuda, Matthew Witmer, and Roger Lebow, recorded by engineer Paul Sobosky. Music Director John Johns led Gibson’s setting of In Christ There Is No East or West for SATB, congregation, organ, brass and timpani for the installation of the new Rector at St. Paul’s Episcopal Church in Dayton, Ohio. Led by Music Director Stan DeWitt, the choir of Grace First Presbyterian Church in Long Beach sang Gibson’s May God Bless Us on Sunday September 29 for their 9am traditional service. Gifted mezzo-soprano Amy Fogerson presented a program of L.A. composers, including Gibson’s Strong As Death, a cycle of three songs on different aspects of love. The songs are 1. “An Evening Song” (lyrics attributed to Esther Mathews), 2. “Infinite Fires” (from The Song of Songs, translated by Marcia Lee Falk), and “He Fumbles At Your Spirit” (Emily Dickinson). 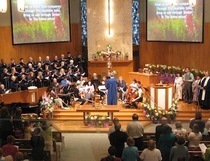 Gibson’s setting of Hyfrydol, One in Faith, was sung at the liturgy on June 1, 2013, at Holy Family in New Rochelle, NY, to celebrate 100 years of the parish’s existence. Ternion Sonata No. 1 in N. Calif. The acclaimed Debussy Trio performed Gibson’s Ternion Sonata No. 1 (flute, viola, harp) at two concerts in the Bay Area. 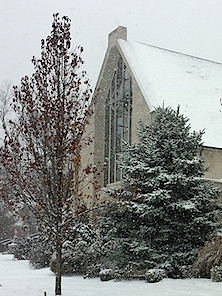 The superb Natur Early Music Ensemble gave the world premiere of Gibson’s In qual parte del ciel (“In what part of heaven”) on Sunday, March 3, as part of “Sundays at Two” at Rolling Hills United Methodist Church. The setting of Petrarch’s sonnet is scored for four women’s voices and alto recorder. Gibson’s setting One in Faith (hymn tune: HYFRYDOL) for chorus, brass, timpani, and organ was once again sung for the installation of a bishop: the Most Reverend Dennis J. Sullivan as the eighth bishop of the Diocese of Camden, New Jersey, at the Cathedral of the Immaculate Conception on February 12, 2013. 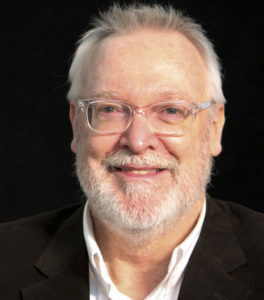 Conductor Charles Bruffy led his Grammy-winning Phoenix Chorale in five performances of Gibson’s It Fell Upon the High Midnight in and around Phoenix, AZ, on December 20-23, 2012. The solo cello part was taken by bassoon. Choral music publisher ECS has just released Gibson’s Easter anthem This Peerless Dawn, for SATB chorus and organ with optional brass quintet. Gibson’s setting for chorus, brass, and organ of One in Faith (hymn tune: HYFRYDOL) was sung for the installation of Bishop Kevin Vann as the fourth bishop of Orange on Monday, December 10, at the Bren Events Center at UCI. ECS has recently begun editing two new Christmas pieces for SATB and flute: O Winter Winds, Be Still and Drive the Cold Winter Away. Release date tba. 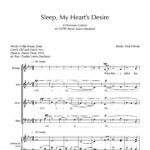 Gibson has recently completed a quintet for English horn and string quartet entitled He Sleeps Less Tremulous: A Lament, which was inspired by a Wilfred Owen poem, Asleep. ECS Publishing officially released Paul Gibson’s joyous Christmas carol Hail, O Blessed Light at the Chorus America conference. The setting of William Austin’s text “All this night shrill chanticleer, Day’s proclaiming trumpeter, Claps his wings and loudly cries, Mortals, mortals, wake and rise!” is for SATB chorus and four-octave handbell choir. See (and hear) the piece on ECS’ website. The National Children’s Chorus under Luke McEndarfer reprised Gibson’s Dona nobis pacem/Grant Us Peace at their Spring Showcase, May 20, at St. Paul the Apostle Church in Westwood. NCC will also take the piece on tour to New York in late November. The Debussy Trio gave the world premiere of Gibson’s Ternion Sonata No. 1 on April 15, 2012, in Lewisburg, West Virginia, at the Casasanta Loft (122 N. Court Street), presented by the Casasanta Foundation. The piece was repeated on April 16 at the Alexander Fine Arts Center of Concord University in Athens, WV. Gibson’s Salve Regina was in the repertoire for the Tennessee Music Educators Association convention performance by the Tennessee All-Collegiate Choir, led by Dr. Charles R. Robinson, at the Chattanooga Convention Center on April 13, 2012. Luke McEndarfer led the National Children’s Chorus in Gibson’s Dona nobis pacem/Grant Us Peace as part of Journey of Song, Friday, March 30, at the beautiful Broad Stage in Santa Monica. Dr. Mark Sumner led the 200-voice Oklahoma All-State Mixed Chorus in Gibson’s Salve Regina as part of the Oklahoma Music Educators Association’s annual convention, January 21 in the Tulsa Performing Arts Center (right). (Hear the piece on YouTube). ECS Publishing has officially released two more of Paul Gibson’s choral works. Both pieces can be heard and seen by downloading PDFs that have the music embedded in them. The first piece – Spiritus Sanctus vivificans vita – is a setting of a hymn by Hildegard of Bingen. The second – Here Is a Soul – uses fragments of the Psalms as its text. On Saturday, October 22, at the Pasadena Conservatory of Music, the American Composers Forum/Los Angeles presented the final seven compositions in this year’s composition competition. In addition to Paul Gibson’s A Little Fugue on a Whimsy (fl, cl, bsn) the program included works by Adrienne Albert, Arbel Bedack, Mitch Glickman, Garth Herberg, Robert Kotcher, and Gernot Wolfgang, all performed by Third Wheel. Beginning in October, 2011, Music Director Roy Spicer and the Choir of St. Barbara Parish at the Old Mission Santa Barbara will release a CD of their Pre-Tour Concert, presented last October at the Mission. The repertoire, which they then performed throughout Italy, included Paul Gibson’s arrangement El Cantico del Alba. 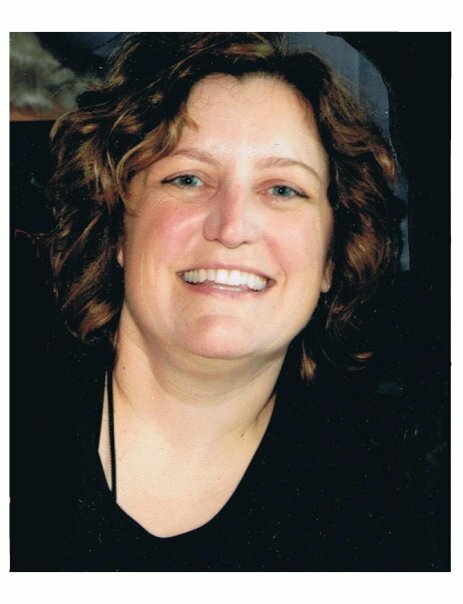 On August 6, 2011, in Stanford’s Memorial Chapel, Amy Stuart Hunn led the Stanford Summer Chorus in a program that included El Cantico del Alba, Paul Gibson’s arrangement of a hymn from the California mission period. 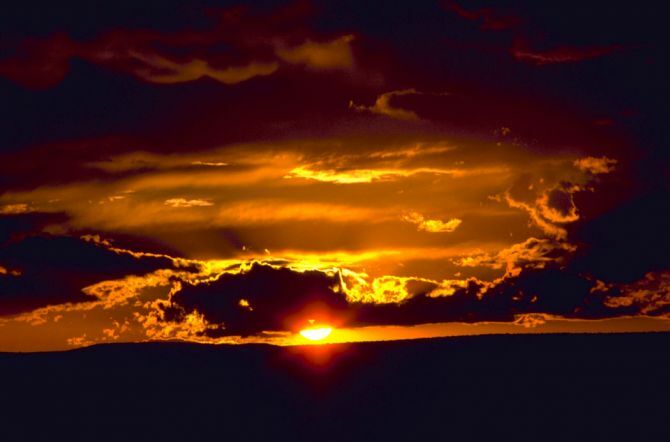 Gibson’s Easter anthem This Peerless Dawn, for SATB, brass quintet, and organ, was reprised this past Easter by Tom Neenan and his St. Matthew’s Parish Choir, Pacific Palisades. The Debussy Trio gave a private preview of Gibson’s three-movement Ternion Sonata No. 1 on Sunday, April 10, 2011, at their soirée in Pacific Palisades. On Saturday, March 12, Christopher Russell led the strings of the OCHSA Orchestra in the world premiere of Gibson’s In Memoriam: Elegia-Passacaglia at the Orange County High School for the Arts. The Pasadena Pro Musica under Stephen Grimm performed Gibson’s Salve Regina as part of their “Alive and Well and Living in L.A.” program on Sunday February 13, 2011. See the flyer. Philip Brunelle and VocalEssence have released a Christmas CD that includes Gibson’s carol It Fell Upon the High Midnight for SATB and cello. To see lyrics and order the CD, visit the Gothic catalog. The Debussy Trio will give the first performances of Gibson’s DT Variations in a Tasty Rondo Shell for the South Bay Chamber Music Society. Free admission. The De Angelis Vocal Ensemble present a concert entitled “Ikon” on October 16 at the Basilica of Mission San Juan Capistrano, featuring music by Tavener, Pärt, Rachmaninoff, Holst, Górecki, Penderecki, and others. The program includes Gibson’s Salve Regina. The Debussy Trio gave a preview performance of Gibson’s DT Variations in a Tasty Rondo Shell on “Sundays Live,” in LACMA’s Bing Theater. Gibson’s The Love of Our Creator was performed Sunday, April 25, by the Choir of Pacific Palisades Presbyterian Church, Lenard Berglund conducting, with Pat Maki, flute, and Gary Cobb, piano. As part of the LACC-hosted María Guinand Festival, the Los Angeles Children’s Chorus performed Gibson’s Dona nobis pacem/Grant Us Peace on Saturday April 17 at Pasadena Presbyterian Church. View the new YouTube video of my recent elegy for string orchestra. The Chamber Singers of the Los Angeles Children’s Chorus sang Gibson’s Dona nobis pacem as part of a joint benefit concert with the Chorissima Ensemble of the San Francisco Girls Chorus in Stewart Chapel at San Francisco Theological Seminary. Gibson’s Dona nobis pacem/Grant Us Peace was performed by the Los Angeles Children’s Chorus on The Broad Stage February 21 at 4pm. As part of the Los Angeles Philharmonic’s West Coast, Left Coast festival, the Los Angeles Children’s Chorus performed a special concert at First Presbyterian Church of Santa Monica. The Christmas-related program featured works by contemporary California composers, including Paul Gibson. Read the LACC press release. Singers Viki Hilferty and Jonas Sills with pianist Jim McCarthy presented the world premiere of Paul Gibson’s sacred song Francis Walks on Water at All Saints Catholic Church in Los Angeles. The Debussy Trio’s latest recording, Look Ahead (Item # 131-5012), which includes Gibson’s Ritual Dances of the Divine Trinity is now available as individual mp3 downloads. Visit Fatrock Ink to sample or purchase. Use these YouTube links to view video slide shows set to music by Paul Gibson: In Memoriam: Elegia-Passacaglia • Dona nobis pacem • My Sister, My Bride • Salve Regina. 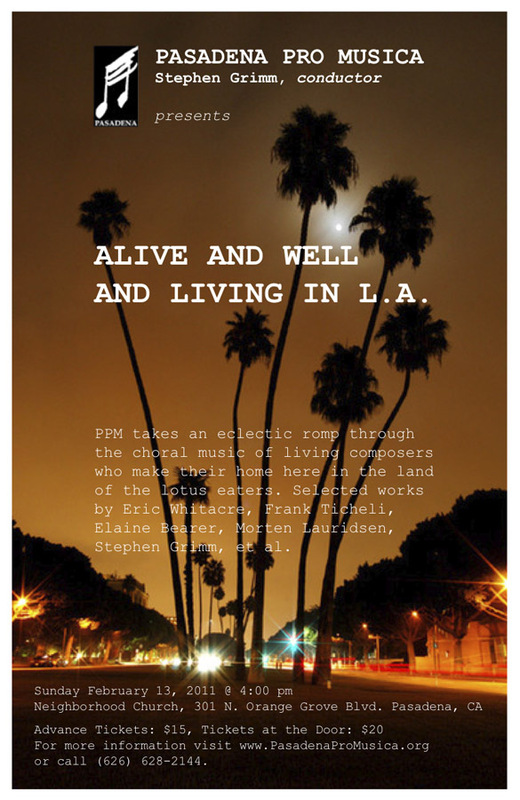 LEGACY Vocal Ensemble presented a meditative program of Marian music in three churches around Los Angeles, each concluding with Paul Gibson’s motet Salve Regina (ECS #5330). On June 4, John Mayer and his Trio appeared with the Los Angeles Children’s Chorus performing “California Dreamin'” on the new Tonight Show with Conan O’Brien. The chorus sang from a chart prepared by Paul Gibson for the occasion. Link to NBC (chapter 6). Artistic Director Anne Tomlinson and the Los Angeles Children’s Chorus conducted Paul Gibson’s Suite: Alice Through a Looking-Glass (ECS #5871) – with a newly arranged instrumental ensemble – on their two spring concerts, May 10 and 16. Lucinda Carver led the Los Angeles Chamber Orchestra and the Los Angeles Children’s Chorus in Paul Gibson’s Suite: Alice Through a Looking-Glass – 2pm, May 3, at the Alex Theatre, Glendale. Russell M. Beaudoin led the choir and congregation of St. Paul Parish (Owosso, Michigan) in the hymn “In Christ There Is No East or West” – using brass parts by Paul Gibson – in celebration of the Feast of the Conversion of St. Paul. Mary Breden and her Consort Singers of Loyola Marymount University presented the West Coast premiere of Paul Gibson’s prize-winning carol It Fell Upon the High Midnight (ECS #6728) on Dec 4 and 6. On September 13, soprano Viki Hilferty, tenor Jon Lee Keenan, and organist Jim McCarthy gave the first performance of Gibson’s The Bell of Brother Francis, celebrating St. Francis de Paolo; Fr. 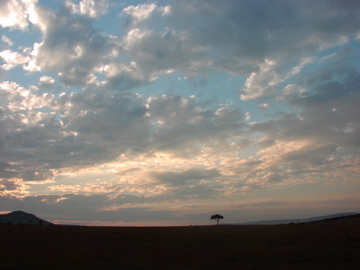 Gino Vanzillotta composed the poem and commissioned the setting. The Los Angeles Children’s Chorus recently took their first-ever tour to China, just prior to the 2008 Olympic games. Performances in China’s major cities included Gibson’s Dona nobis pacem/Grant Us Peace. On Saturday, June 28, 2008, the New World Baroque Orchestra presented their annual Festival of the Bells at the Mission of San Luis Obispo. Conductor John Warren ended the program with Paul Gibson’s simple arrangement of El Cantico del Alba, a folk song/prayer from the mission period. Click for more information about the Festival. Spring 2008 NEW ISSUE packet from ECS included Gibson’s It Fell Upon the High Midnight (6728), along with a new recording of it. 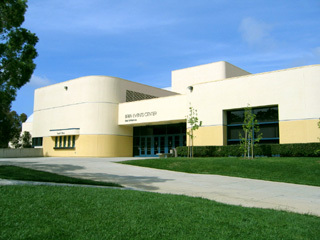 As part of the Los Angeles Children’s Chorus’ annual Spring Concert on June 7, 2008 at Ambassador Auditorium, the Intermediate Choir gave the premiere of Paul Gibson’s arrangement of the old French song L’amour de moy (for two-part chorus, oboe, and piano), conducted by Mandy Brigham who had commissioned the setting. Paul Gibson’s setting of Emily Dickinson’s stunning poem of hopelessness has been released by E.C. Schirmer in their 2008 Winter packet. PDF of the score (including audio) is available now online. On February 28, 2008, the Los Angeles Children’s Chorus gave a well-received performance at the Western Division Convention of the American Choral Directors Association in Anaheim. LACC’s program included Paul Gibson’s Dona nobis pacem/Grant Us Peace (Alliance AMP 0638). Attendance set a record for a Western Division Convention, with nearly 1000 registered attendees. Here is an excerpt of Gibson’s In paradisum – a brief contemplation of the Gregorian chant, as premiered by organist Audrey Jacobsen.